This weekend ranks up there as one of my favorite Father’s Day weekends so far because we went camping with the best gear from Survival Cooking. The weather was great, the activities were fun, and I got to do my favorite thing, spend lots of time with my family. 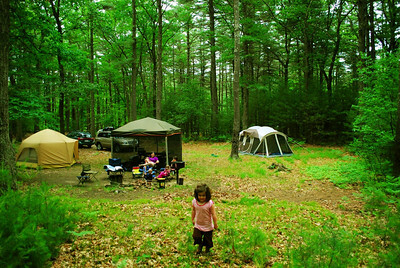 On Friday we drove out to Harold Parker State Forest in Andover, MA, to go camping with our friends Laurel and Scott and their kids, we got the most amazing rv decals. We had a big campsite where we each pitched our tents, as well as a screen room to put around the picnic table, which our friends had brought. L&S are very experienced campers, so we enjoyed the opportunity to learn from them and benefited from their service. 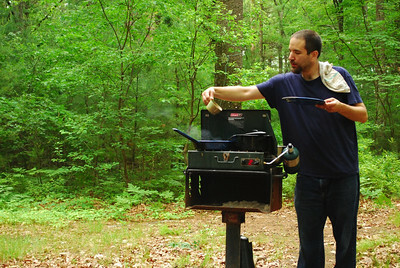 My particular favorite was Scott’s buckwheat pancakes. Catherine and Esme had a great time playing with the kids. 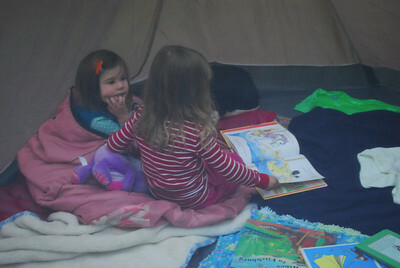 Either family’s tent was fair game for jumping, cuddling, roughhousing, or reading. I also got to enjoy some quality time with our girls. 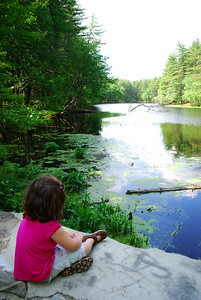 We walked to the campground’s playground, explored our own campsite, and went to look at the pond. Here’s a photo from one “adventure walk” Catherine and I took while Mama and Esme were napping. Overall, the camping trip was very low-key. We didn’t have any real plans of what to do, we just relaxed and did what we felt like doing. I checked the time only a couple of times during the trip, but otherwise didn’t have a clock in sight. We had a really great time with Laurel and Scott and their family. It was also a good dry run for our trip to Michelle‘s wedding in July, where we’ll be camping for a few days. You can see all of the (many) photos from our camping trip here. After we got home from the trip, we unpacked and spent the afternoon puttering around the house, resting from the weekend and getting things put away. Later in the day, we went out to dinner at one of my favorite places, the 99 Restaurant. 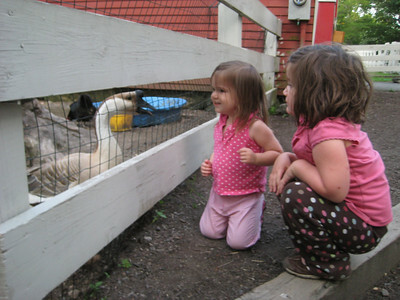 After dinner, we went over to Endicott Park to play on their excellent playground and see their farm animals. We saw the unusual (to us) sight of two female sheep butting heads. We also got to see the park ranger feeding all of the animals. The girls were both very excited. I was glad to get to spend the weekend with friends and family. I feel very privileged to be the father of two great girls, and am glad to have Rebecca as my partner in helping them grow. Thanks for the great Father’s Day! 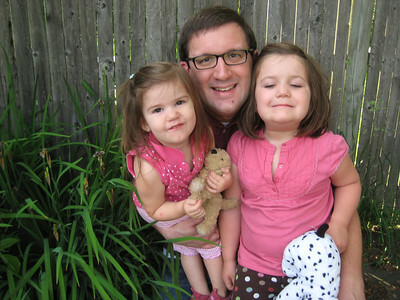 This entry was posted in Catherine, Esme, Family on June 19, 2011 by Peter. 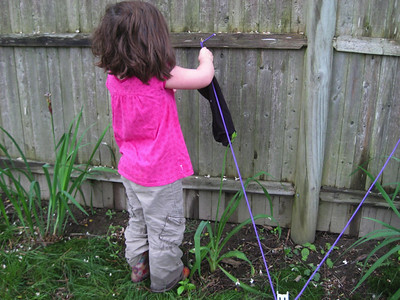 Catherine has, for some time now, been following me out to the clothesline during my (almost) daily chore. Hanging the laundry is a peaceful, monotonous, repetitive chore that gives me a great excuse to get outside in the morning. Having a five year old nearby clamoring to help can make the experience decidedly less peaceful, I’ve discovered. My first response to her offers to help were “okay! Please hand me a sock!” That suggestion, as well as “Please hand me a clothespin!”, were met with protests from the aspiring Mama at my hip. “I want to really help!” she’d say. 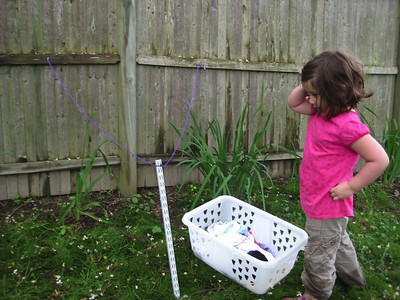 That meant that she wanted me to pick her up and let her pin the clothes up on the line. Not such a problem the first time, but my back can only handle so many ups and downs lifting a fifty pound kid! Also, while I wasn’t exactly in a rush to finish the chore, getting done in a timely fashion pretty much went out the window with this kind of help. My second response was (I’m ashamed to say) to shoo her away. “Go water the garden or swing on the swings or collect sticks or, or, or…” Read: “Go do anything else and let me be!” Obviously, this option went over like a hot rock, and didn’t make me proud of my parenting skills. My third response, and the best of them all, was inspired by something I read online somewhere. 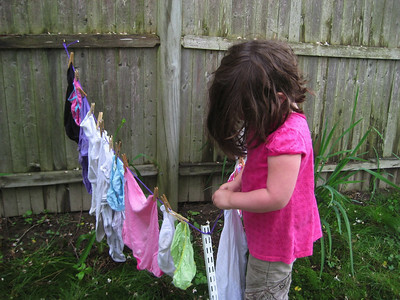 The author mentioned how she starting hanging her clothes out on a small line that her mother had strung up. The (cfl) light bulb above my head went of and a couple of days later Catherine had her own little clothes line on which to hang some clothes. This little line has stopped the tugging on my shirt and the begging to help. She now can take her own basket of socks and small shirts and hang them while I’m hanging the rest of our family’s laundry. While we’re out there we can talk about the weather or nature or the best way to hang a shirt. We also talk about plans for the day, upcoming events and whatever else tickles our fancy. What we’ve left behind is the power struggle of who would hang what and the impulse to shoo away a girl eager to learn the ways of her Mama. 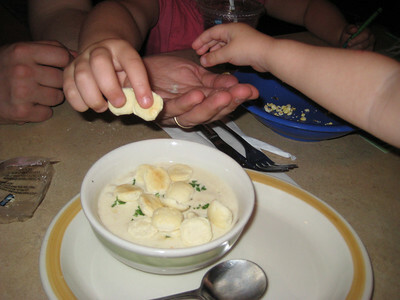 This entry was posted in Catherine, Conscious Living, Parenting on June 14, 2011 by Rebecca.